Oral hygiene is vital for good dental health. Let’s learn to brush and floss well. Develop effective habits and stick to them. Good oral hygiene results from a team effort. You do the brushing and flossing, and we’ll take care of you during your regular dental appointments. Preventive dentistry, x-rays, cleaning, scaling, polishing, fluoride, and proper brushing/flossing education – we’ll do that for you. It doesn’t take long for problems to arise, so regular dental appointments are vital. We recommend that you have your teeth cleaned at least every six months. We scale your teeth to remove plaque and tartar build-up; we clean above and below your gums and we shine your teeth with a polish. We also recommend an annual X-ray to detect problems that we might otherwise miss, such as decay, bone loss, cysts, or infection. You can show us your brushing and flossing techniques and we will make sure you are doing this properly – a little bit of advice can go a long way. We sometimes suggest a fluoride treatment to strengthen your teeth, make them more resistant to decay, and help prevent cavities. During your visit, we will visually screen for oral cancer. We’ll be on the look-out for white or dark red patches on your tongue or in your mouth, or any lumps or sores. Early diagnosis is crucial. Regular visits to our office are important to maintain good dental health. In between visits we’ll count on you to take care of your teeth. 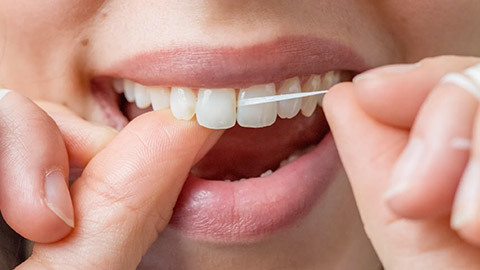 Brushing and flossing are easy things to do, but doing them well takes time and effort. We’ll help you create and maintain good habits.